This is a perfect lightweight duvet that works perfectly in the summer. I highly recommend it. Enjoy the comfort and style of this Hotel Grand oversized comforter. The cotton shell is stuffed with Siberian white down with a 650 fill power for extra warmth. A white stripe pattern gives the comforter a simple elegance, and the baffle box construction keeps the fill in place for evenly distributed warmth. I'm happy. It's what I expected. I'm pretty happy with the product so I'll give a 4 out of 5. I did get what I paid for. Don't expect the equivalent of a $*** down comforter for the that price. You just won't get it. The ad is somewhat misleading in that it does not indicate the percentage of down, in the ad. Leaving one to mistakenly believe that they are getting a DOWN comforter and not a DOWN & FEATHER comforter (which is what this really is). This is NOT 100% down. The stuffing label indicates that it's 70% down, the rest is feather. The power fill in the ad says 700. That would ordinarily indicate a rather high quality down. I'm a bit skeptical on that note but unless I cut the comforter open and withdraw an ounce of the down, I can't prove it...it's really not worth the effort and to be honest, I may have expected it to feel like my high end sleeping bags which may have more oz. of fill sq. ft. If I paid $*** for it, I might give it some serious thought. I sold high end down sleeping bags and extreme weather gear for a living, so I do understand down, power fill numbers and down vs down and feather. I also know what good quality down costs....and this isn't in that price range. It is however, about the best quality you should expect for the price. I don't notice any fill escaping the cover, like some. That's a bonus. I purchased a cheap duvet cover for it mainly to keep it clean, (but also to contain any loss so I could see if this was a problem and how big a problem it was). With down, you will have the odd escapee, but this certainly is within the realm of normal loss if not better than normal. I have used the comforter for almost two weeks now, with nothing showing as far as feather loss. Stitching seem to be good quality, with the allotted open spaces between each baffle to allow down/feather transfer between baffles. You want this!! (Some previous reviewers felt this was a fault. Not so!) Look carefully at the photo in the ad. It is of TWO comforters (one on top of the other), both on a twin bed or maybe 3/4 bed. There's a lot of over hang in that photo. I purchased the Double/ Queen for my QUEEN sized bed, which was fine for me. (My mother had purchase one previously so I knew what to expect). It overlaps the side of the mattress by about 8 inches on both sides. If you want more than that go with the King. Cleaning instructions indicate dry cleaning only. Personally...I NEVER dry clean down duvet/comforters or sleeping bags, or jackets for that matter and there is no reason why you would have to dry clean this. You can go to a laundry mat with over sized from end loading machines (for large comforters) Twins can probably be done in a home front end loader. Use a mild soap specific for down sleeping bags (found at most outdoor outfitters). Never use in a top loader. It will tear it apart. DRY it along with a few clean tennis balls or a pair of old but clean cheap canvas sneakers on low to medium heat. This beats the feathers back up to a nice fluff. NEVER hang to dry. You'll get cemented clumps of feathers balled in the baffles. If you did this by mistake(don't give up), try soaking the article for a while, spin then, drying it as I described. Drying does take a long time. You're best bet is to use a duvet cover and wash that and only wash the down comforter when absolutely necessary. I live in Canada, and we keep the house pretty cool at night. My room is the coldest one in the house. This comforter does give me the extra warmth I've been looking for but in the same breath, it isn't overly warm. Bottom line, it's worth what you'll spend on it. I'm happy with the purchase. I would give it 5 stars if they ad was a little more honest in it's method of presentation. For the price, I'd buy another one. After letting it fluff back up to regain any loft lost during shipping, I noticed that several of the baffles were empty -- contained little to no filling. The manufacture's materials content tag also said that this is only 75% down, which would make this a very over priced feather comforter -- not a luxurious comforter by any means. "Heavyweight" in the description is right -- most of the weight is from the thick shell required to keep the quills from sticking into you while sleeping. This means that it will eventually flatten out in a few years from its own weight. I love this Hotel Grand Oversized 500 Thread Count Extra Warmth Siberian White Down Comforter. The comforter sheds the filling so that the whole room is filled with down. I bought this replace and old comforter that was shedding its down and now I have the same problem with the new one. I would not recommend this to anyone. Pure Luxury at a LOW Price! I have to admit, I was skeptical when I ordered this comforter. I went to ***** and looked at several heavyweight down comforters but they were all priced at $350 and above, so naturally I wondered why this heavy weight comforter would be such a steal (even though I love, LOVE Overstock.com). I read a couple of the bad reviews and thought that those instances were probably pure accidental bad quality items and it wasn't worth stressing over, so I ordered one and crossed my fingers. When it came in the mail, I immediately put it on my bed and saw that it was very light feeling, thus perhaps it's not as warm as it claims to be? So that night I put on my long sleeved sleeping shirt and got ready to get up in the middle of the night for more blankets. I should tell you I'm a 2 comforter type of girl. I get cold really easily always have 2 comforters except when it's 90 outside. I live in Seattle, where in the winters it gets to be about 30's most of the time, so not freezing, but it's no Florida. Much to my surprise, I was actually hot the next morning! This comforter is so warm and cozy. It's like it heats up around you~! It's lightweight quality allows you to sleep comfortably so you don't feel like you're being buried in cotton. Pair this with a comfy duvet cover and you're all set for the Winter! I love, love, love it and think that this is a MUST HAVE for every bedroom! This is an excellent product. I chose it for the 4 reasons:1-the weight of the down: 55 ounces.2-the fill power of 700.3-the cotton with 500 thread count construction.4-the baffled box design.I compared all the comforters and made a chart with these 4 criteria and it appears that this one was the best comforter.....on the paper.On the bed, it is also perfect.I highly recommend it and the price is certainly right. I bought this comforter after getting tired of sleeping under a pile of blankets to stay warm. I was amazed at the price and the value of a 700 fill count. I bought the comforter, but was worried about the fact that it said "Siberian" fill (after researching online, I found that there is no such thing as Siberian goose down- "Siberian" means it can come from anywhere) and I didn't like that the brand name wasn't on the blanket, and that the actual down filling percentage wasn't on there. I took a risk and bought it based on the other reviews. I got it yesterday and LOVE IT. It came and didn't smell at all, it fluffed up in a few hours; it's filled with white goose down and the down percentage is 75%. It is so warm and fluffy. We sleep in a cold basement in an old house, around 60 degrees, and I actually got hot with my pajamas on. It is a very warm blanket, a very good buy. I'm very pleased with my purchase! I needed to replace our old, cheap down comforter. The down shifted so much that much of it was just two sheets of cotton - massive cold spots! So I did a lot of research, read all about Canadian goose, Hungarian goose, thread count and fill power. In the end, I decided that 500 thread count was more than good enough, but the most important things were (a) the total amount of down (indicated by fill power), and (b) how it was made (box stitching to avoid the fate of my old useless one). I realized that cost was not a good indicator of either quality or value, but I was still prepared to pay hundreds of dollars for a good one. 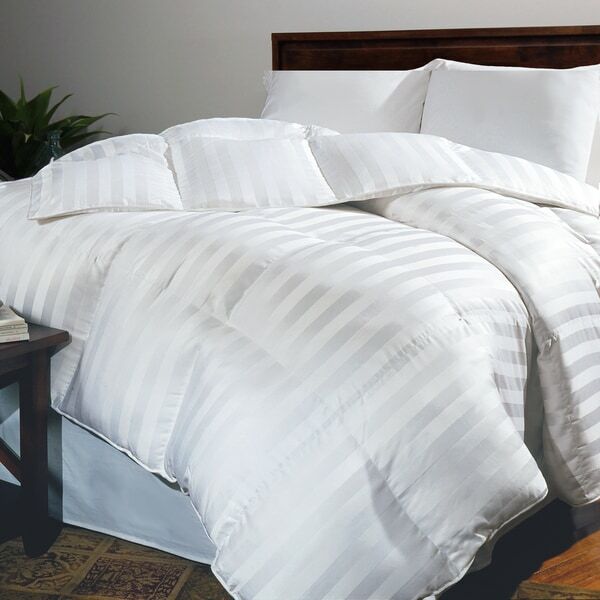 Then I found this 600 fill power 100% 500 thread count striped cotton comforter on Overstock.com - an oversized King comforter for $****!! After I unpacked it, let it "breathe", and fluffed it up, I could not believe how plush and luxurious it was. We've now had it for a couple of months, and it is fabulous - light enough not to be oppresive, yet more than warm enough for the cold Upstate NY nights. This was a great buy - thanks, Overstock! I researched many down comforters and read countless reviews before settling on this down comforter. I can say that I am 100% pleased with my purchase! I liked the cabana stripe design. It sets it apart from the plain white ones you see everywhere. One of the reasons I selected this one was because of the 700 fill power. This comforter is HEAVY and will keep you WARM! I needed something heavy for the cold northern Indiana nights. I usually have the thermostat set to 65 at night and use an electric blanket in addition to my down comforter, but since getting this one, I turn the thermostat OFF at night and no longer need the electric blanket. I actually wake up drenched in sweat. I do not recommend this comforter for those living in climates where temperatures do not drop below freezing at night, and this is definitely not a comforter you will want on your bed come summer. The baffle box design minimizes shifting of the down. I've used mine for about 4 weeks now and haven't noticed any shifting. This is a rather large comforter at 88"x88". This is a great size! Be careful when shopping for a duvet cover that you get one large enough. Some are only 86"x86". If you are looking for something to keep you toasty warm on those cold winter nights...and possibly save on your heating bill...this luxurious comforter is for you! I think this comforter is terrific. It does what it's supposed to, it looks handsome on the bed, and is an excellent value for the price. This review is being written only after using the thing for six weeks, so I think the assessment is a fair one.Why did I buy it? For WARMTH! My bedroom is pretty darn cold. Last winter, I would wake up several times during the night because I was uncomfortably chilly. Piling on extra blankets only helped a little. This year, I researched comforters and finally decided on this one. End of problem! I'm warm and comfortable all night long.Let's address the concerns of other reviewers --1) It fluffed up quickly when removed from the bag2) It had no discernible odor. (The bag had fabric panels with small holes, which may help here. )3) I've had no problems with "dust". (The 500 thread count seems to be a tight enough weave to contain everything. )4) I've had no problems with the down filling shifting unacceptably between baffles.5) Yes, there was no label on bag -- but there's a tag on the comforter itself confirming that the filling is indeed down (and not some 'alternative'. )6) No, it's not a "Year-Round" blanket. Look at the Fill Rating! If you live in a warm climate, this will probably be way too hot.An equivalent would have cost far more in a store... believe me, I checked. I'm pleased and would recommend this comforter without hesitation. I read all the reviews before I bought this comforter, so I can't say that I was not forewarned. I thought "oh...it won't happen to me", "oh...those people write reviews for everything and they have high standards". But, I was wrong. I have never written a review before, but after 1 year there was NO down left in the center and all the down went to the edges. I had to give it away. I went back to my prior comforter that is about 20 years old (yeah, I know gross), but it is in much better shape... more down and better distributed. So, if you bother to read these reviews....then heed my advise.... do NOT waste your money! 1 year later and I have to get another one. I will get one that is probably twice as much as this one. But I know that a good comforter can last more than a decade rather than less than one year. I bought this comforter because it was advertised as heavy weight. I have a need for serious warmth because of a health condition. I also wanted a comforter that was heavy on my body at night. I labored over my decision for a long time and carefully read each quilt description over and over.. The comforter is, in fact, very light in weight and only moderately warm. In fact, I pulled out my old comforter I was replacing, after sleeping with this one a few nights, and am using that instead. Sadly, I was hoping for a toasty wintertime with this.I was worried about not being able to actually see and feel the comforter, and I my worry was well-founded. This is not a Heavy Weight Comforter. I am so disappointed. I bought the King size for my queen bed, and am very impressed. It is of good quality, hangs over on all sides (I sleep alone, but would be good for a pair +), is not shedding feathers. Living in Minnesota, I need a pretty serious down comforter to survive the winter; this keeps me warm, is not heavy on my body, and makes the bed inviting! MAY YOU RIP, 12/10/09 - 10/10/10. feathers everywhere by 6month mark. tried to revive, with no luck. baffled squares didn't help. had to 'fluff' 2/week and risk being 'snowed on' with feathers. now have to buy another one to replace. This is a good down comforter. If you've never had a down comforter before, you'll probably love it. It's soft and cozy and warm and light. HOWEVER, this comforter is advertised as "heavyweight," which it is not. It is comparable to "medium warmth" of most other down comforters. The loft is okay, but it certainly doesn't feel like 700 fill power. I thought a 700 fill power King down comforter for this price was too good to be true, and it was. It's not bad, it's just not heavyweight. If you're looking for a super thick, tons of down, tons of loft comforter, keep looking. If you want a regular, medium warmth comforter, this is perfect for you. You shouldn't be able to use a "heavyweight" comforter year round, and you could use this year round no problem.The seam around the edges is not that nice looking, and I wouldn't use it out of a duvet. Additionally, it's VERY small- I ordered a king for my queen bed, and it's perfect (slightly *smaller* than the lightweight summer queen comforter I already owned from BB&B). I wouldn't order this comforter if I had a king sized mattress. DEFINITELY order one size up and don't expect heavyweight. Beware the claim that this comforter has a baffle box design. When mine arrived there were clearly open sections in each baffle box, allowing down to quickly shift from the center (where you want it) to the edges (where it's useless). Fluff this comforter every night, not every week! The color and pattern is perfect. I made the mistake of buying the King based on the picture. I wanted a comforter that appears like the picture with the over hang. It turned out too small and it’s not adjustable to even look suitable. My resent comforter easily hang over the sides and the end of the bed this doesn’t come close. I’m forced to return it not wanting to be cause it is the exact color etc... I’ll try another maker. Great quality down comforter I highly recommend it. Just right for hot or cold nights. Bought for mobile home. We love this comfort. However for our king size bed, it isn’t long enough to tuck in the bottom. It doesn’t seem that any of them are. They need to change the size to accommodate these larger mattresses. But this comfor is light& warm. Love this comforter, it is perfect for my climate. Cold in the winter and hot in the summer . It doesn’t suffocate me but keeps me toasty in the winter . I love this comforter. It is 10 years old and I just noticed that I never reviewed it. If this comforter is still being sold I highly recommend it. Still in excellent condition after many years of use. This is my second one I have bought and the first one was thicker and better than the last one. "I’m looking for something very fluffy... would you say it’s extra fluffy???" It is a very nice comforter, however, I would not call it extra fluffy. If you want something very fluffy then you need to buy a down comforter with filler fill power. The higher the fill power the fluffy the comforter will be. This comforter is 650 fill power which is very high. Or you can try ITEM# 918019, this comforter is also 650 fill power but 5oz more in filled. "There have been many reviews about feathers shedding and shifting to the point of baffles being empty. Also not being warm like advertised. Can someone tell me if this is true and if it is a duvet insert of comforter. Thanks"
This is not a duvet insert. It is VERY warm on the coldest northern nights. The down does not shift at all. As with any down comforter, it should be fluffed daily to maintain maximum loft. An excellent comforter! I ordered a twin and have had no problems with it at all. I purchased a duvet cover for it and it fit into the twin size cover beautifully. It has a plush, soft cushy feel to it. I haven't washed it. It's exactly what I needed and wanted. "What are dimensions of comferter"
"how do a attach to the duvet? is there ties or buttons?" My duvet cover has clips at the corner to attach to the comforter. This comforter does not have ties or buttons to attach to the duvet cover. "Does this comforter have to be dry cleaned?" yes. to keep it clean (without dry-cleaning) buy a duvet cover which is washable. Hello Varuna62, we apologize for the confusion. The comforter is filled with Siberian white down fill. Thanks for shopping with us! "Down fiber" means detached barbs from down and plumes or from the basal end of a feather quill shaft that are indistinguishable from the barbs of down. It is a blend of undeveloped feathers and polyester fibers.